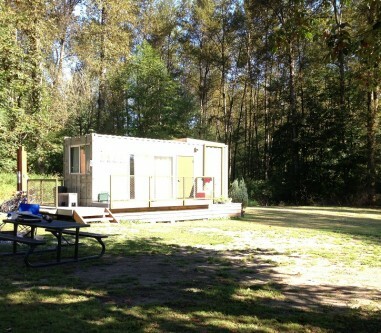 King County’s Tolt MacDonald Park is unlike any campground I’ve experienced. It’s very close to the Seattle area, and just outside the city limits of Carnation. From the campsite it’s a 13 minute walk to the grocery store, complete with Starbucks. I wouldn’t be surprised if pizza delivery was available. Many of the camp sites aren’t surrounded by trees, with the benefit of having grass-covered camp sites (dirt-free camping!) and the drawback of losing some privacy, though some sites are surrounded by shoulder-high plants and others can be made private with strategic tent placement. There’s a huge grass area perfect for kite flying or a game of Frisbee, and a wooden suspension bridge over the Snoqualmie river to more camp sites. On the far side of this pedestrian-only bridge you’ll find more tent camp sites, yurts, old log cabin style shelters, and a shipping container that’s been converted into a cabin. The river has a rocky beach and a few places for fishing. There are also hiking trails, and although I came across many mountain bikes, it was still nice for hiking. The 224 leaves Redmond Transit Center at Bay 5, and arrives at NE 40th St. at the south end of Carnation. Walk 0.4 miles West to the camp entrance. There aren’t any weekend buses to Tolt MacDonald, but there are six weekday buses in each direction. A well-organized camper could leave after work on a Friday, and only miss a little work Monday morning. Google tells me the trip from downtown Seattle takes around 1.5 hours. If three nights is too much, this trip might be a good opportunity for bike camping. According to Google Maps, the park is only 11 (albeit hilly) miles or so away from downtown Redmond and the 545. Or, take the Burke Gilman and Sammamish River Trail and ride all the way from Seattle. A hybrid approach is also possible, for example, ride out to the campground on Sunday and take the 224 bus back Monday morning. If you’re into backpacking, an 8-mile hike (one-way) from the #209 and Fall City is also possible, although if you want to do it this way, you’d better do it quick. The last Saturday service to Fall City before the upcoming restructure is next week. I’ve biked there from Seattle to camp. It was nice, but there are some stretches of busy road with small shoulders. Just FYI. If you’re gonna bike/bus it, might be nicer to go to issaquah than Redmond (not sure). That park is really fantastic. I used to work at a nearby summer camp and we sometimes took the kids there on hikes or for a picnic. Also, the pizza place by the QFC is good. Be aware that this segment of the 224 route will be going away with the fall restructure. There will be a replacement Snoqualmie Valley shuttle route that should connect with the 209 in North Bend, Snoqualmie and Fall City. The shuttle connects with the 224 in Duvall. So the Snoqualmie Valley Shuttle doesn’t have a schedule, as far as I can tell? Do they just expect everyone to call and schedule a ride in advance? Where did it say it didn’t have a schedule. Comments in Metro’s pdf indicate that the shuttle “will run about every 90 minutes on weekdays” and that the new route 224 will have a “timed connection in Duvall so riders can conveniently transfer to the new Snoqualmie inter-valley shuttle” seem to imply that there will indeed be a schedule. Most likely, the schedule has simply not been posted yet. I couldn’t find a schedule on the metro or the Snoqualmie transit website. Hopefully they get one up before it starts running. We went camping there earlier this summer. Noticed the bus stop near the entrance. Carnation is a cute little town (I snapped a picture of the the Ace Hardware/General Supply/Liquor Store) with a nice walkable downtown. Couple of restaurants and bars. Neat car shop there on the corner. Island Transit serves South Whidbey Island State Park. Camp Long (http://www.seattle.gov/parks/environment/camplong.htm) is right in the West Seattle. You can rent an overnight cabin there.